FFE Magazine > Life and Lifestyle > Tech > Valentine’s Day Apps. If you have run out of ways to celebrate V-day, Romantic Ideas may just be able to help you. This app. offers not one, not two, but 500 different romantic suggestions for you and special someone to do on the special day. Free / Updated: Aug 15, 2011 / Version: 1.3 / Size: 0.9 MB / Compatible with iPhone, iPod touch, and iPad. Requires iOS 3.0 or later / NOTE: You must be at least 17 years old to download this app. Give your loved ones the best dessert on Valentine's Day and indulge in some chocolate goodness. Find chocolate! Has over 2500 listings of chocolate shops located all over the World. Besides finding the nearest chocolate shop, you can also rate and review any chocolate and chocolate stores, add a photo of your favourite bonbon, and add a chocolate shop/factory that is not on the list yet! Free / Size: 7.8 MB / Seller: Wilmor Publishing Corporation / compatible with iPhone, iPod touch, and iPad. Requires iOS 4.2 or later. Woo your special someone with romantic words. Love Poem boasts of 1000 poems and quotes you can send to your family friends, or post on Facebook or twitter instantly. You can also make your own poetry and contribute it! Do you ever wonder if you and your partner are compatible with each other? Valentine scanner checks the chemistry percentage between you and your partner by asking you and your partner to put your fingertips on the screen. Sending V-cards to your loved ones express how much you care about them. This year, why not compliment your greeting cards with digitally framed photos of yourself, with friends, family, or your partner. 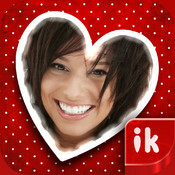 Love and Valentine's Day Frames app. has over 40,000 frames to choose from online, 32 built for off-line use, and over 30 effects to enhance your photos. You can use all of them on different occasions as well. PRICE: $0.9 / Updated: Jan 24, 2013 / Version: 2.7.6 / Size: 15.4 MB / Compatible with iPhone, iPod touch, and iPad. Requires iOS 5.0 or later. This app is optimized for iPhone 5. Be the ultimate Valentine by surprising your special someone a beautiful bouquet of flowers. Even when you are overseas or stuck at work, 1800 Flowers is so convenient because it allows you make online purchases or gives you directions to the nearest flower store. Impress your loved ones with 101 ways to Say I Love You. The app. teaches you say, â€œI love youâ€Â in 101 languages. More importantly, it suggests 101 romantic ideas or sayings about love that will definitely touch your heart. A way to a man's heart is through his stomach! Surprise your partner with a delicious meal courtesy of Valentine's Day recipes. This app. contains over 140 romantic and succulent dishes that you easily whip up. Do not be surprised to find funny names of recipes, such as Love potion,Â as these are all intended to make your night more special! PRICE $0.99 / Updated: 04 February 2011 / Version: 1.01 / Size: 1.1 MB / Requirements: Compatible with iPhone, iPod touch and iPad. Requires iOS 4.2 or later. Make Valentine's Day memorable with the Truth or Dare app. It is specifically designed for people in relationships, partners, married and couples. With over 1000 steamy truths & dares, you will be able to explore more about each others intimate secrets and desires. Not only will this app. help deepen your relationship, but you can spend hours playing the entertaining game. Send custom-designed electronic cards through Facebook or email with Be Mine (Lite). This app. has simple and easy-to-use tools to make card giving on Valentines more convenient. PRICE Free / Updated: Jan 24, 2012 / Version: 1.1 / Size: 21.2 MB / Requirements: Compatible with iPhone 3GS, iPhone 4, iPhone 4S, iPhone 5, iPod touch (3rd generation), iPod touch (4th generation), iPod touch (5th generation) and iPad. Requires iOS 4.0 or later. Create a profile of your lover's favorite things, important dates and anniversaries, and personal data such as clothing sizes. 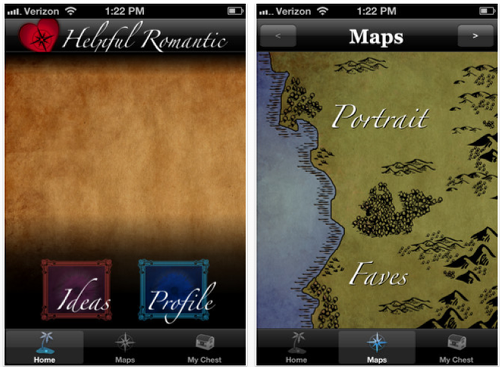 Helpful Romantic app. can help you think about what your partner truly enjoys and appreciates, and offers you great surprise ideas just in time for Valentines. 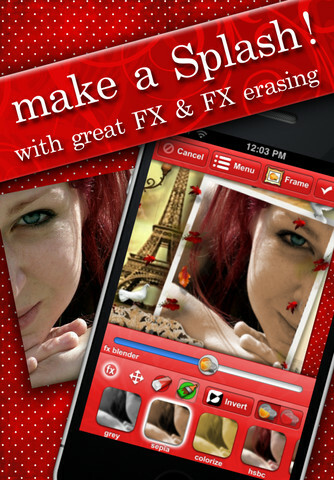 PRICE $0.99 / Updated: Jan 18, 2012 / Version: 1.1 / Size: 9.4 MB / Requirements: Compatible with iPhone, iPod touch, and iPad. Requires iOS 4.2 or later. Gift Ideas for Girlfriend app. allows you to browse through different categories and shop online for your girlfriend. Whether it is for Valentine's Day or her birthday, you'll never be caught scrambling to find her the perfect gift at the last minute! This app. also features updated daily deals, travel deals, fashion ideas, relationship articles, and even a credit Card Repayment Calculator, and a Bar code Scanner. 2) You can anonymously like this person or skip to the next suggestion. 3) If someone you like happens to like you back, then Tinder makes an introduction & lets you chat within the app. UPDATED: 01 April 2013 / Version 2.0 / Requires Compatible with iPhone 3GS, iPhone 4, iPhone 4S, iPhone 5, iPod touch (3rd generation), iPod touch (4th generation), iPod touch (5th generation) and iPad. Requires iOS 6.0 or later. This app is optimized for iPhone 5.